Ann Hamilton creates site-specific, multimedia installations that are simultaneously immersive and ephemeral. Combining the sounds of mechanization with the motorized release of sheets of translucent white paper, which gently descend from the ceiling, at hand speaks to the decline of manual labor in the wake of technological innovation. 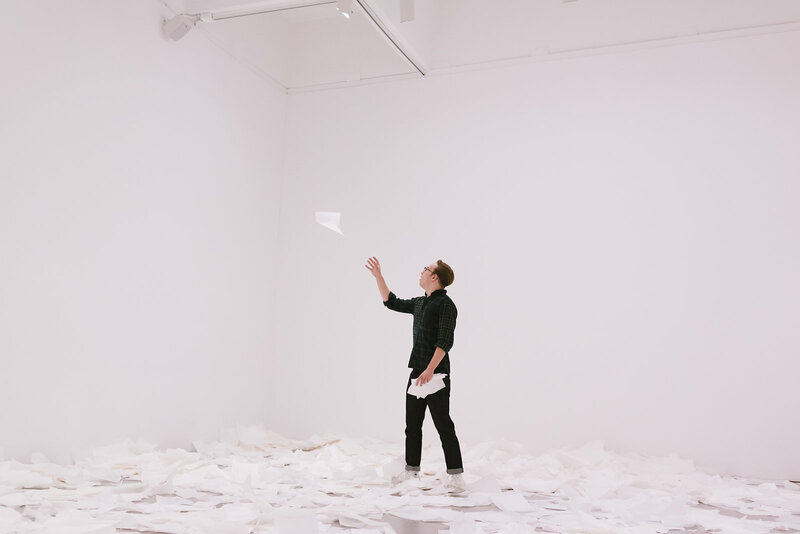 Though the paper accrues on the gallery floor in a sculptural “drift,” the effect of the installation remains one of loss and absence; the paper is blank, the movement is random, and the hand of the artist remains invisible. Hamilton provided some thoughts for your visit: Can you hear the silence of the paper falling through air? The gestures and actions of a hand that might hold and the mouth that might speak from the rimmed space of the page form a litany of possibility. Your presence becomes part of the project—you are free to touch the paper and explore the space but please observe and respect it’s quiet and slow rhythms. Try to listen to the silence of the paper falling through the air.